Siliphos is a milk thistle extract. It is made of 100% food grade materials. Siliphos prevents scale formation and stops corrosion of pipes. After months of use, it can actually slowly remove existing scale from pipes and appliances. Siliphos acts as a sequestering agent, coating the inside of pipes and making a thin protective layer on metal surfaces to prevent scaling, corrosion and brown or red water. Siliphos does not alter the taste of the water. 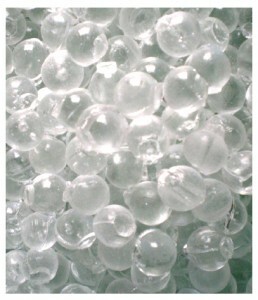 It dissolves slowly into the water and acts by preventing the adhesion of minerals to metallic surfaces. It can be added as an inexpensive whole house or point of use treatment. Siliphos spheres can be inserted into the center core of carbon block or sediment filters or dispensed through a separate filter housing installed in the water line. The larger system with separate housing lasts longer and supports higher flow rates. Unlike a conventional water softener, Siliphos is inexpensive, easy to install, does not use salt or electricity, and does not add sodium to water. All Units have replaceable cartridges. 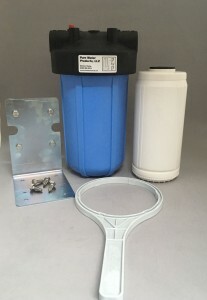 Mid-Sized Siliphos Unit, uses 4.5″ X 9.75″ replaceable (or refillable) filter cartridge with 200 siliphos spheres. Cartridge replacement cost is $89.